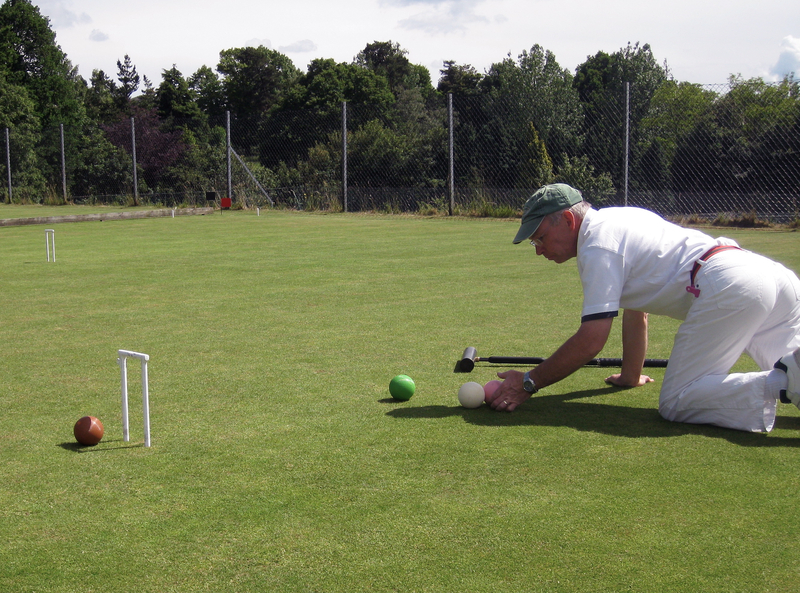 There are several variations of croquet, but the main ones are Association Croquet and Golf Croquet, both of which use exactly the same equipment and are played at the club, and for both of which free and expert coaching is available. In both games Black and Blue balls play against Red and Yellow and follow the same order of playing the hoops. Golf Croquet is easier to learn, with one shot per turn, and is a very popular sociable game played at a fast pace. See here for a good description. Association Croquet is more complicated with longer turns (you get an additional shot if you go through a hoop and two extra shots if you hit another ball). It requires many different types of shots and is often described as being akin to Snooker played on grass; as you become more proficient so you are able to build longer turns and use both attacking and defensive moves. See here for a good description. Both Association and Golf require great skill to compete at the top level and both are played to European and World International level. There’s also a handicapping system in both games, involving extra shots (called bisques), to allow weaker players to play even games against stronger ones, so you don’t have to be worried about being much weaker than your opponent! Unlike most outdoor sports, both men and women are able to play croquet socially and competitively and on equal terms. At Tunbridge Wells we have a membership covering all ages and in more or less the same proportions of men and women. It is a game, too, that can be played to a high standard by those who are not as active as they once were! Some quite severely disabled people enjoy playing croquet. However, please note that although our main entrance has 10 not so easy steps wheel-chair access is available via a side-entrance across the lawns. See also World Golf Croquet Championship 2012 for a 30 minute TV programme shown on South African TV. It was sponsored by the WCF, Kapara Insurance Brokers and CCj. Other Press Coverage, including local ones, can be seen here. The Croquet Association web site contains an account of the historical origins of croquet and Oxford Croquet has an interesting section on croquet history . There are reports of the game being played in Ireland in the 1840s. It was demonstrated at the Great Exhibition in London in 1851 and quickly became popular as a social and recreational activity on lawns at country houses, vicarages and colleges. It was the first open air sport to be played by ladies as well as men. At that time country houses often played their own version of the game and there have been many local and personal variants of the game. In 1860, at Chastleton House in Oxfordshire, Walter Jones Whitmore codified croquet into its two versions, association and golf. The first standardised laws of croquet were published in 1864 by John Jaques and included with sales of croquet sets made by his firm. Some stranger locations for croquet! We don’t play in weather like these, although the weather’s somewhat better in the US picture (that’s the Americans for you). 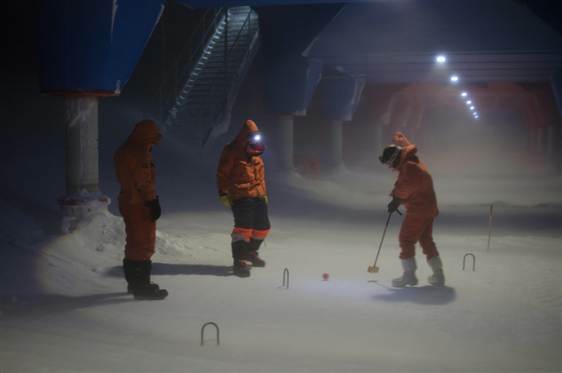 Staff wintering at the British Antarctic Survey’s Halley station play a round of outdoor croquet in 40-mph winds and freezing temperatures to celebrate the Queen’s Diamond Jubilee. 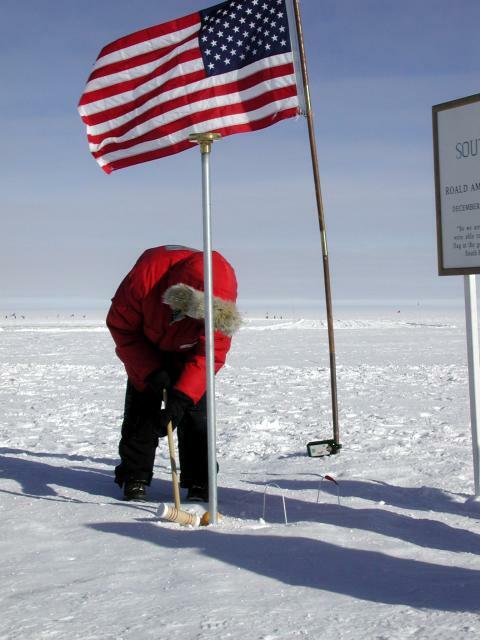 Photo: Sam Burrell, British Antarctic Survey.